It's part of the vision of Google News to crawl and index every word of every news story, around the world. It’s a lot of information, but we’re working on ways to make this index more specific. For example, our local news feature allows you to view news stories from a particular area. Now, we’re taking this concept and making it visual: the Google Earth and News teams are working together to provide you with a new way to explore current events, via a real-time News layer on Google Earth. When zoomed out, you'll see the top stories from around the globe, tagged on the globe via placemarks. If you're interested in the news about a region, just zoom in and you'll find news stories about that location. We hope this layer provides you with another way to explore and discover news, perhaps about places you didn't even know existed. 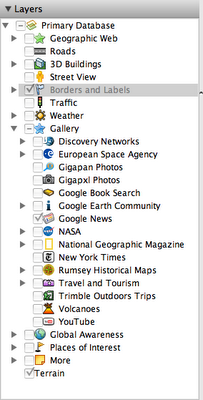 To activate the Google News layer, navigate to the "Layers" menu on the left-hand side of Google Earth. Expanding the "Gallery" node in the layers tree will expose the "Google News" layer. Check the box next to the Google News layer and start zooming into the places on the globe in which you're interested. 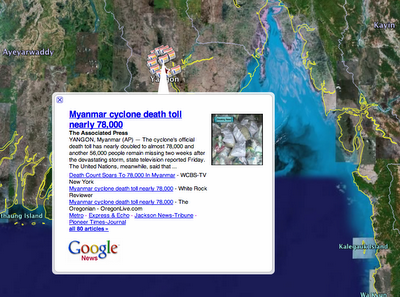 Each story is represented by a Google News icon on the globe. Clicking on the news icon opens up the news story's snippet, along with links to learn more about the event.